I do wonder what the Japanese anime industries obsession with Pop-up Pirate variants is. I mean, it’s not quite common enough a thing for me to consider starting up an entirely new blog segment for recording their appearances, but this is hardly the first time I’ve seen such a game in anime, if maybe the first I’ve see with a cat involved. 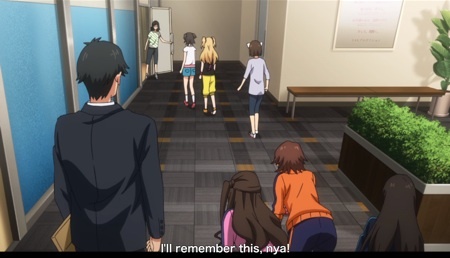 Anyway, it’s somewhat hard, coming out of this weeks episode of Cinderella Girls, to not retrospectively feel that we were a little bit spoilt across the last two episodes of the show, at least where the animation production was concerned. I would say that it was, therefore, somewhat unavoidably disappointing to get something which was just kind of ordinary after two episodes lead by particularly idiosyncratic and accomplished animation directors, but the fact is that there are even a handful of real continuity clunkers in this episode that really shouldn’t have slipped through. 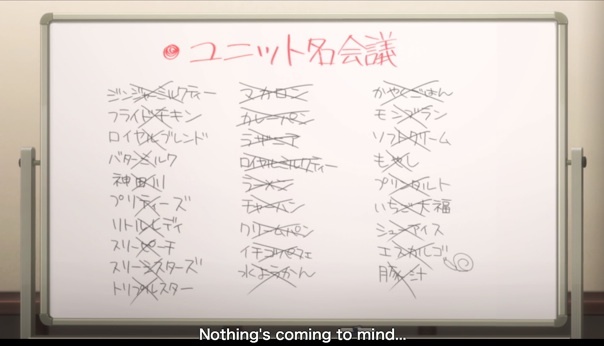 Which isn’t to say that the episode is entirely without merit, but it’s mostly things in the script, and mostly injokes, that really bolster this episode beyond humdrum, although there being things in the anime that are based upon cards from the game should hardly be much of a surprise to anyone at this point. Also, the animation still probably looks better than the broadcast version of that Hibiki episode from the original aniM@S TV show, so it does have that going for it! Hey, isn’t the frog-suit kind of Takane’s thing? I do find it amusing that the drama in this episode mostly comes from the fact that, whilst not necessarily dense, the Producer is rather a little on the uncommunicative side simply from the fact that he’s a little too blunt about things. He doesn’t actually lie or anything, but the fact that he repeatedly answers things in exactly the same fashion rather bites him in the arse when people stop believing them. I guess that’s the frustration of never feeling like you are getting a straight answer out of folks, though. The most forgivable face in the world, right? 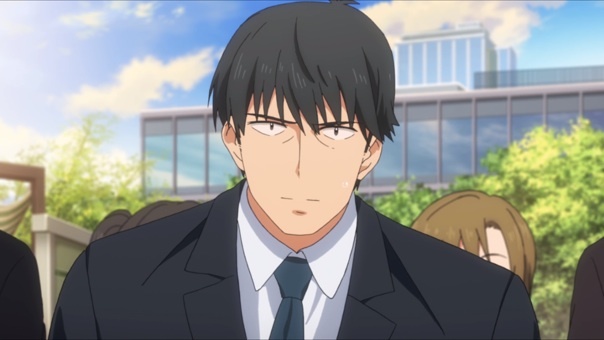 Also, Producers apologetic face is even more terrifying than his normal one. 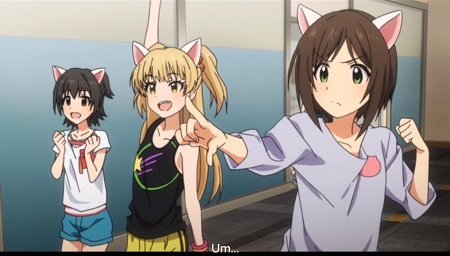 We do have a number of characters voiced for the first time in the franchise in this episode, no doubt paving the way for them to, in a weird twist of thematic synergy, make their CD debuts sometime in one of the forthcoming waves of the endless Cinderella Girls character CD series. Perhaps weirdly, the most significant feeling amongst them to me is probably Oikawa Shizuku, now voiced by Yuri Noguchi, who looks to pretty much be a newbie in the industry. Oikawa was popular amongst… a certain kind of fan artist for a while, no doubt due to a combination of excessive bust-size and her habit of both making the sounds of and dressing up as a cow, much like in that infamous episode of Melody of Oblivion, one supposes. I guess Katagiri Sanae and Yamato Aki are newly voiced this episode too, but I’ve not heard of those two before, so how important could they really be, eh? 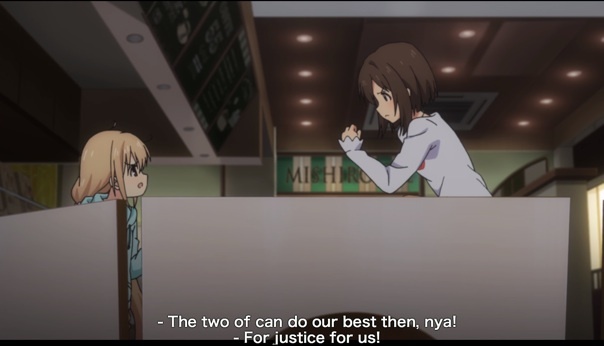 Daisuki neglected to bother subtitling the barrage of names that Mio came up with (in the cuts in which the board didn’t magically go blank mid-scene, at least), but needless to say, they’re mostly low-tier foodstuffs and drinks – I’m pretty sure Royal Blend is the brand of canned coffee you see several folks drinking in this actual episode – though there’s a couple of oddities in there like Pretties and Three Misters (which, let’s face it, they should have went with, although now that I look at it, it’s more likely Three Sisters. Bloody katakana…). It’s not really worth translating the lot, because they’re exactly the kind of nonsense you’d expect Mio to be throwing out there, honestly – that they are nonsense is pretty much the takeaway you are supposed to get. The name they eventually go for, New Generations, is their canonical unit name that they’ve released tracks on Cinderella Girls CDs under already. 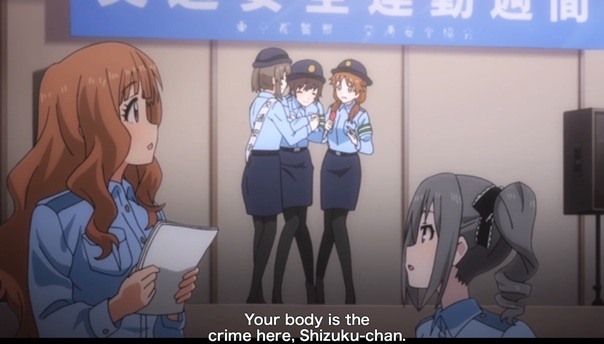 Most the other girls significantly represented in the show have only had named group songs released with non-Cinderella Project idols, so Love Laika is new here, though I’d imagine we’d have to be getting Anzu and Kirari teaming up as AnKira at some point given how often they’re being smushed together in the show. 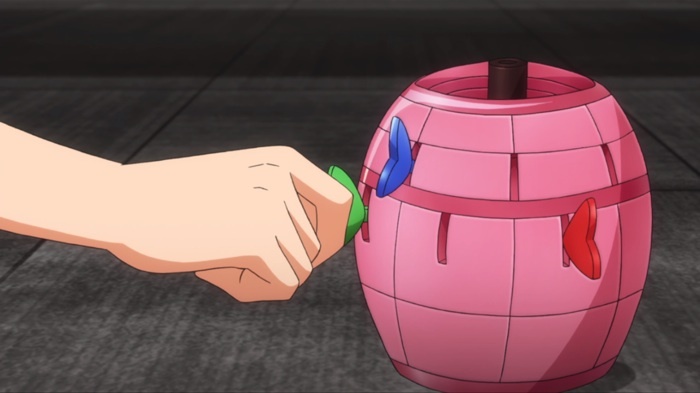 I’ve been pondering if there’s anything in here worth comparing to the previous iM@S TV anime – the immediate thought would be to go with episode 6, which immediately follows the establishment of Ryuuguu Komachi at the end of the previous episode. The difference in approach between the two is that, in aniM@S, the focus is rather on the fact that it’s the Producer who is feeling frustrated at being left behind, rather than the idols – he’s getting them all sorts of work, but little of it is fitting. 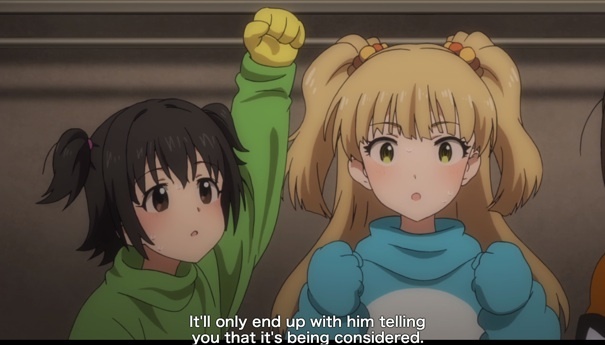 It’s the other way around in Cinderella Girls, in that the Producer has a larger view of what is going on and where he needs to go, but the girls are starting to feel rather listless at the fact that those who came into the project after them have already started moving ahead. Part of the result is the same, in that there’s a feeling that the rest of the team are falling apart in light of several of them having been brought together, but the tone achieved is somewhat different. 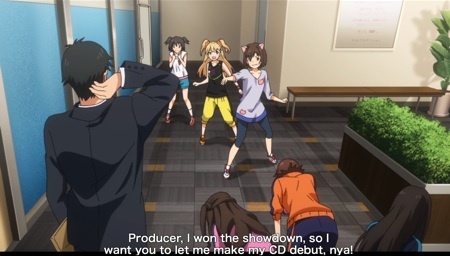 I daresent say that those who weren’t particularly fond of aniM@S’s Producer will find the Cinderella Girls approach somewhat more to their taste. Also, you can pre-order Rin’s tie at AmiAmi now, though I’m betting the lines on the knot won’t go in the wrong direction on the physical thing like the do in the show. Bah. Joke aside you are kind of right, it’s a rush job and people missed stuff. Like the oversized ipod shuffle, which was my biggest luls moment regarding animation issues this week. And still they worked in all the key aspects that you mentioned, building on the Producer’s n00bness, lack of communication (skills), laying the ground work for some of the other girls, what have you. “Love Laika” sounds all kinds of terrible and suggestive to me.